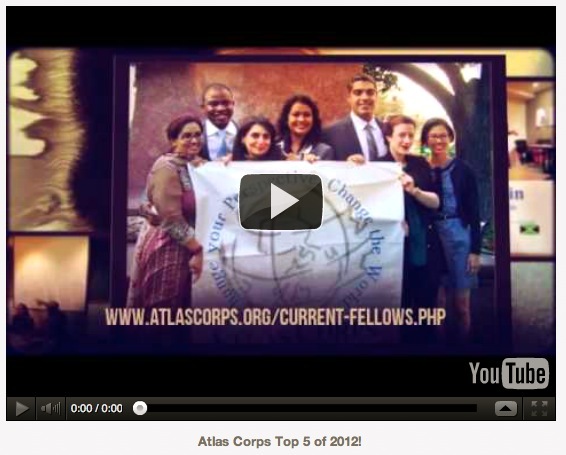 » Atlas Corps Top 5 of 2012! Atlas Corps Top 5 of 2012! Click here to watch the Atlas Corps Top 5 of 2012! Our strategy to expand from 50 Fellows to 100 Fellows a year by 2015. Read more online at bit.ly/atlascorpsvision2015. Achieved 140 Fellows from 40 countries! Received applications from more than 150 countries. Launched 3 classes a year! We now welcome Fellows starting in January, May, and September. Initiated 2 major initiatives with the U.S. State Department that will support 14 Fellows from Sudan and 5 Fellows from Pakistan. Announced that our 1st Fellow ever selected in 2007, Sergio Zuluaga (Colombia), was named Director of Entrepreneurship & Social Innovation for the Government of Colombia. Happy Holidays from Atlas Corps! Thanks for being a special part of our network. Celebrate our Top 5 of 2012 with an end of the year gift! Remember, there is a $1 for $1 match on all contributions up to $20,000 received before the end of the year. Double your donation instantly at donate.atlascorps.org.